It’s another hopeful sign that Fort Worth is on track to becoming one of the country’s more bicycle-friendly cities. The city has an excellent network of paved trails, mostly along the Clear and West Forks of the Trinity River. It has in place a comprehensive plan to promote bicycling “as a safe and attractive transportation alternative.” It has delineated bike lanes on major thoroughfares to and around downtown, and it’s considering a bike-sharing program. Now, Mayor-elect Betsy Price, who is to be sworn in July 12, is leading 21 days of bicycle rides in Fort Worth to coincide with the Tour de France. The first of the rides was today, actually the day after the start of the Tour de France. 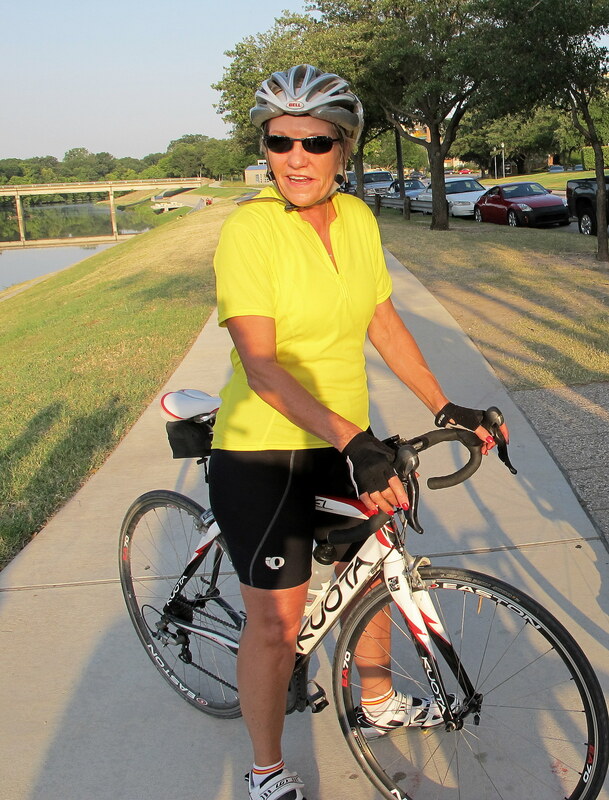 About 20 local cyclists turned out to accompany Price on a ramble of about 16 miles along the Trinity River Trails. “Whether you decide to ride along with us, ride with others along other biking routes in Fort Worth or walk or run along your own personal route, we would be honored if you would be a part of the Tour de Fort Worth,” says Price, 61, who previously was Tarrant County’s tax assessor/collector. Today’s ride began a bit after 7:30 at the trailhead at University Drive near the Hoffbrau Steaks restaurant. The ride on Monday, the Fourth of July, is to begin at the same location, but a half-hour earlier at 7 a.m. because Price is to appear in a parade at 9 a.m. If you’d like to ride with the mayor-elect, go online to http://www.TourdeFortWorth.com for the time and place of the rides. She said she would post the starting point and time for each day’s ride at least a day in advance on the Tour de Fort Worth website. I had the opportunity to ride along with Price for a time during today’s ride, from the University Drive trailhead southwest along the Clear Fork of the Trinity to Bryant Irvin road and back. I told her of a couple of local cycling groups on Fort Worth’s Near South Side, the Night Riders and the Bicycle Betties. Price, a cyclist for 20 years, said she would like to ride with them or include them in her daily Tour de Fort Worth rides. I and some friends plan to join Price on the Independence Day ride. Come out and ride with us. That, is a cool mayor!